1. Activate an unexpected adventure. Experience Kissimmee, the marketing arm of tourist destination Kissimmee, FL, known for its adventure parks and alligator attractions, could have lured consumers down south over the winter with a promise of warm experiences. Instead, the destination embraced the cold and tied in a Kissimmee favorite: a zip line. Securing the first commercial activation approval ever at Chicago’s Millennial Park, the destination dared urbanites to take the zip line thrill ride during a snowy weekend. 2. Make them work for the free stuff. Put down the t-shirt rockets and offer up a (share-worthy) challenge. Like the Greater Palm Springs Convention & Visitors Bureau did, teasing hard-to-impress Manhattanites with two giant ice blocks to promote JetBlue’s direct flights out of New York City. 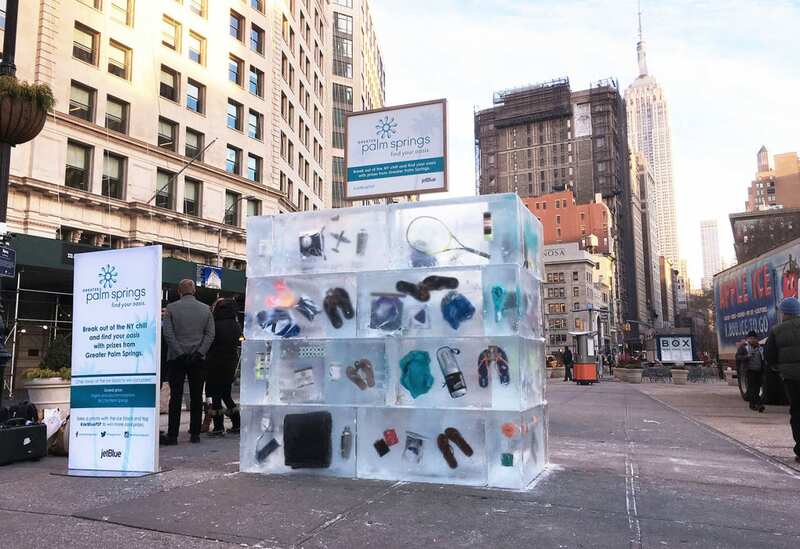 Consumers were invited to use any tools they could get their hands on to “break out of the chill” of winter and chip away at ice blocks with all sorts of warm-weather prizes frozen inside. Of course one of the blocks contained the golden ticket: a free trip. 3. Live-wire a scavenger hunt. New Mexico needed to find a way to get its own residents to vacation within the state. Data had shown most are likely to leave to vacation, compared to residents of neighboring states. Enter Billy the Kid. Leveraging the lore of this Old West outlaw, the New Mexico Tourism Department launched Catch the Kid, a campaign that challenged residents to embark on a summer-long scavenger hunt throughout the state to capture him (played by an actor). 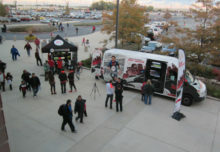 The campaign involved an app and microsite as well as clues via life-size banners. The ultimate prize: $10,000. 4. Host a cultural celebration. Colombia wanted to tell the world it was reinventing itself and show off its possibilities (for business and leisure), so it transformed New York City’s Times Square into a carnival of Colombian experiences. There was two-time Latin Grammy winner Fonseca on the scene, coffee mascot Juan Valdez and Carnival queen Daniela Cepeda. Above it all, a call-to-action billboard featuring a QR code consumers could scan to access a mobile app and enter for a chance to win an all-expenses-paid trip. 5. Enlist influencers to generate content. To illustrate to the world what the U.S. has to offer and, most importantly, how easy it is to get around, Brand USA sent international travel influencers on five great American road trips. Each influencer collected content for Brand USA’s channels and posted photos and video to social media. In a recent iteration, each influencer rode with a crew that helped curate and shoot high-quality video. There was even a cross-country train trip involved. The result: millions of views, comments and impressions.